Don’t let that title make you angry — this isn’t an article written to criticize stay-at-home parents! In fact, this author just so happens to be one. 😉 Here at The Baby Sleep Site, we have the utmost respect for parents who choose to stay at home and raise their babies. For most parents, the decision to leave the work force and stay at home represents a sacrifice of not just money, but of career ambitions, job-related goals, and even adult interaction! (Although we’re betting most stay-at-home parents out there consider the sacrifice worth it 🙂 ) We know first-hand that stay-at-home parents do NOT have it easier! Many people are quick to cite the benefits of staying at home, and the benefits certainly are many. But staying at home can have its drawbacks, too, and those drawbacks can include poor quality of sleep for your baby. Through our work with parents over the years, we’ve found that sometimes, stay-at-home parents unintentionally sabotage their babies’ sleep. Let’s explore things you can keep in mind, if you’re home with the baby. Most of the time, staying at home means that a parent has flexible hours. No more rigid 9-5 schedule; a stay-at-home parent’s schedule can follow baby’s schedule! There are benefits to that flexibility, of course. For example, stay-at-home moms often find it much easier to breastfeed than working moms. Or what about when your baby or toddler is ill? If you’re a stay-at-home parent, taking a sick day is really no problem at all! But, is there such a thing as too much flexibility? Since stay-at-home parents are better able to “sleep when the baby sleeps” (Ha! I know many would laugh at that), they may be more inclined to put off sleep training and continue to get up night after night, many times each night, long after it’s considered necessary. Because stay-at-home parents might have a little less incentive to sleep train (due to their flexible hours), they may be more likely to rock or feed their little ones to sleep, causing their babies to develop sleep associations. This isn’t always the case, of course, but it’s certainly a possibility. Inconsistent schedules tend to go hand-in-hand with flexible hours. For many stay-at-home parents, their schedules are whatever they want them to be. If breakfast doesn’t happen until 10 a.m., that’s okay! If the “afternoon” nap starts around 6 p.m., no big deal! Again, there are definite benefits to having such flexibility in a schedule. Even the most routine-oriented parent needs a little flexibility — life happens, after all! However, flexible schedules can also mean inconsistent schedules. If lunch starts at 11:30 one afternoon and 2:00 the next, it can really throw your baby off (especially if your baby has a sensitive temperament or slow-to-adapt personality and needs a consistent routine.) The more inconsistent your schedule, the less likely it is that your baby’s going to nap well during the day; when she doesn’t nap well during the day, it can lead to more waking at night. Most babies tend to thrive with a predictable naptime routine in place, so if your schedule tends to be inconsistent, it’s likely your baby’s sleep will suffer. 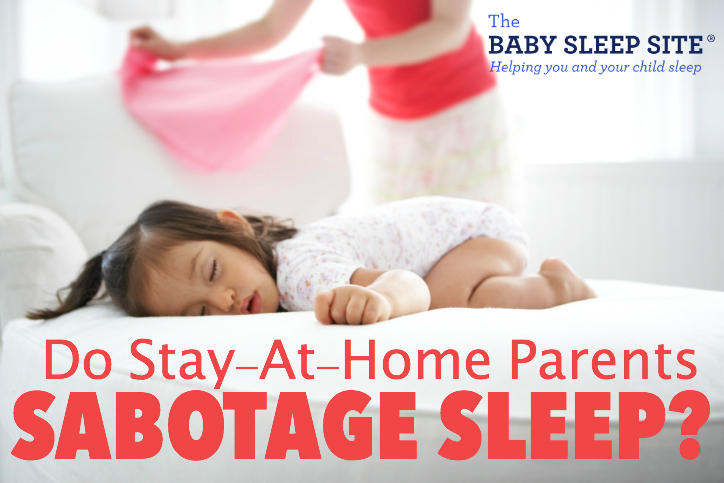 Please know that we’re not labeling all stay-at-home parents as “Sleep Sabotagers”. We know that plenty of stay-at-home parents understand the importance of a good night’s sleep and work hard to make sure their babies get the sleep they need. What’s more, we’re fully aware that there are plenty of working parents out there who might qualify for the “Sleep Sabotager” label! For example, working parents might be more inclined to keep a baby up way past bedtime, in the hopes of squeezing in a little extra quality time. Or perhaps a working parent, who’s already worn out from a week at the office, might not have the energy and stamina necessary to sleep train consistently. All we’re suggesting here is that total flexibility of schedule, one of the major benefits of staying at home, can backfire when it comes to sleep. Regardless of whether you work at home, as a full-time mom, or whether you work outside the home, the fact remains: baby sleep problems can be tough to solve! Between long night wakings, struggles at bedtime and naps that feel all over the place, you may feel like you’re at your wits end. Well, put your mind at ease – you came to the right place! Our consultants at The Baby Sleep Site® specialize in creating Personalized Sleep Plans™ that are customized to your own parenting philosophy and working arrangements, and that will NEVER make you feel guilty or pressured. Even better, once you have your Personalized Sleep Plan™, your consultant will walk you through each step of implementing it at home. What do you think? Did your staying at home (or working) sabotage your baby’s sleep? Share your story!